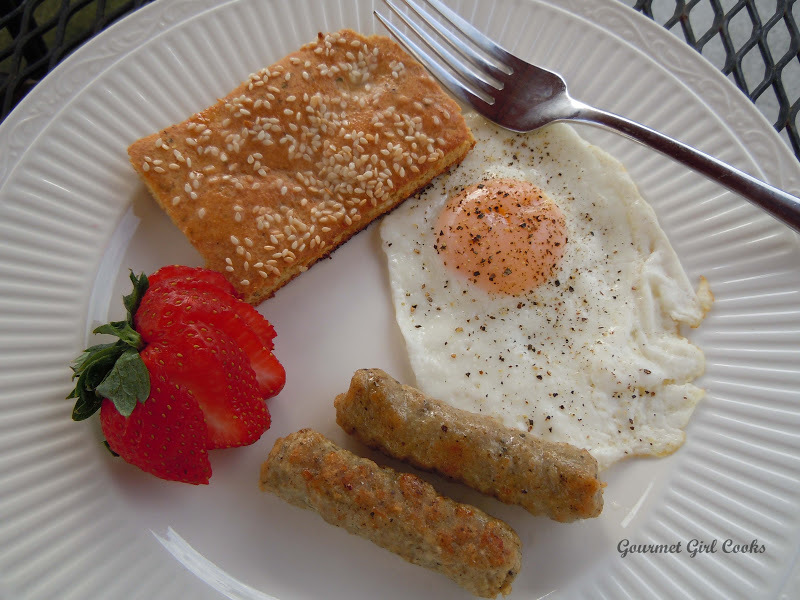 Gourmet Girl Cooks: Breakfast...just me, my eggs, sausage...and Bagel Toast! Breakfast...just me, my eggs, sausage...and Bagel Toast! Today I will be hard at work all day long in the kitchen preparing Thanksgiving dishes, so I decided to start this morning with a good breakfast. I was so excited to have my pick of different flavors of either Bagel/Squagels with cream cheese or Bagel Toast to go with eggs and sausage this morning. I had Asiago cheese, toasted onion, poppy seed and sesame seed as well as "plain" to choose from. 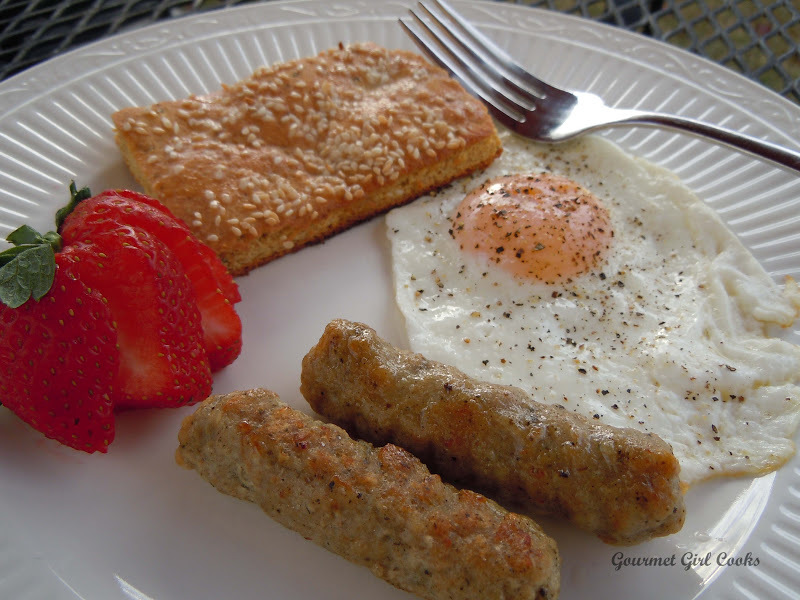 I decided on eggs, sausage, and sesame seed bagel toast -- it was delicious along with a cup of "Eight o'Clock" hazelnut coffee, served at 9:00! 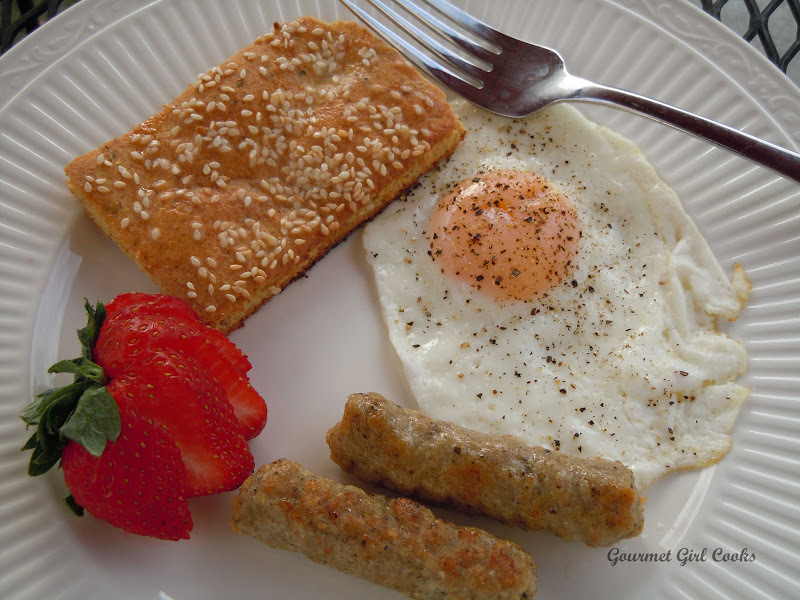 :-) I will be on my feet all day long so thought I'd power up with a good breakfast first. I snapped a few photos of my beautiful breakfast so you could see how easy it could be for you to have a choice of bagels or toast for your breakfast too! Oh, on a personal note -- as of yesterday I have lost 44 pounds in 4 months following the Wheat Belly plan eating like this. I had a doctor's appointment yesterday and am excited to get my lab results back to show the continued and dramatic improvement that I have already seen in my previous labs. This plan has been nothing short of remarkable for me. For those of you that follow WB, I wish you the same success -- it really does work! :-) Enjoy! LOVE your recipes! Been WF since Aug; you have lost more than me, but I'm starting to lose. What sausage do you use? I'm in western NYS~~according to Applegate website I can find them in Wegmans or BJs. Thanks for taking the time to answer & for your recipes, which are a godsend. Happy Thanksgiving! Congratulations on your success with WB. Your site is very informative and engaging. I am just starting the WB change of eating. Thank you! I wish you success with it -- after you get past the first week or two, you begin to feel better and your appetite slowly begins to subside. It's amazing how much wheat and grains really increase your appetite. The bagel/squagels sure do look delicious! Have fun cooking up your Thanksgiving feast!